Moonlight is officially the first film that I’ve seen in the theater in three months. It’s been a long and strange three months (I may or may not get into all that in the near future), but I decided to get out of this dry spell and go see Moonlight. I went into this film without having seen any trailers of television spots, primarily out of a recommendation by a film critic (I can’t remember his/her name) in their review of the film. All I knew was that the movie was getting terrific reviews, and that it was finally expanding nationwide this past weekend. It was playing close to my area, so I decided to go check it out. What unfolded was one of the most emotional and powerful narrative films in recent memory. Moonlight is one of the very best films of 2016. Here’s the review. 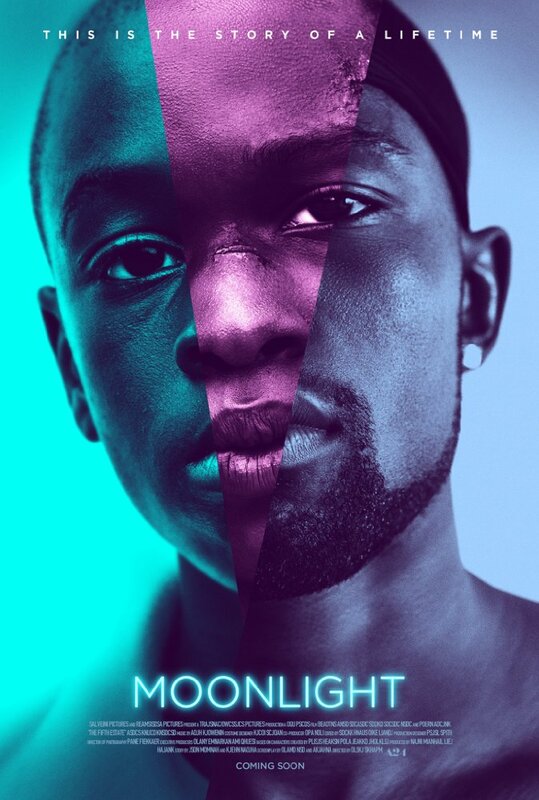 Moonlight follows the story of Chiron, a young black man who we first see as a young black boy. The film follows Chiron’s story from childhood, teenage years, and his adulthood. The first chapter introduces us to a young and insecure Chiron, who finds a father figure in Juan (Mahershala Ali), a Miami drug dealer. But throughout the film, it’s also a study of Chiron and his discovering of his sexual identity. It’s really hard to get into details about the film without giving anything away so that’s about all I can say on that. The film was co-written and directed by Barry Jenkins, and produced by Brad Pitt’s production company Plan B. Jenkins based the film off of a play titled “In Moonlight Black Boys Look Blue”, which was written by Tarell McCraney, who shares a story-writing credit on this film. And what makes this film as powerful and moving as it is, is primarily due to Jenkins’ dedication to this source material, and his non-reluctance to embrace the more emotionally raw and vulnerable aspects of this story. Chiron is a kid who gets bullied in his rough Miami neighborhood for being who he is. Because the film at its heart is the story of a young man trying to discover his place in the world, and having to be a gay man at that. It’s not everyday that we see films about gay black teens in the cinemas, so it’s encouraging that a movie like Moonlight is getting the exposure and mass release that it is. It’s a really moving and beautiful film, and we need to see more movies like Moonlight in that multiplexes. The three actors that play Chiron in the film, primarily teenage Chiron (Ashton Sanders) and adult Chiron (Trevante Rhodes), are fantastic. Chiron is a very quiet and insecure character to begin with, and the majority of the performances from both of these two immensely talented actors involves body language and their eyes. Those are very key elements to the performance, and the two actors are able to capture that brilliantly. Even seeing Chiron as an older and tougher man, Rhodes is able to flawlessly capture his vulnerability and insecurities. For the brief time that he’s on-screen, Mahershala Ali is fantastic as this father figure to a young Chiron. He’s charismatic and lovable, but his drug dealing life still casts a shadow around the relationship. Naomi Harris plays Chiron’s drug-addicted mother, and it’s some of the very best work that she’s ever done. It’s a heartbreaking and angering performance, and one that could potentially give the young actress some awards attention (the same goes for all the aforementioned performers in the film). Jenkins portrays the sexual discovery of Chiron with such grace and beauty that I was in tears by the end of this film. The love that Chiron has for his friend Kevin (André Holland in the adult years sequence) is really beautiful to witness in the film. I wish I could delve more into the themes of this film because there’s so much to cover and say about this film and those themes, but I don’t want to give away too much more. All I can tell you now is that Moonlight is a masterpiece, and a movie that will hopefully be up for plenty of awards in January. It’s not a very easy film to sit through, you’ll feel at times like a bit of an intruder viewing this very emotionally raw and personal story, but this is a very important and moving film. I really hope you go see this film, because we need more stories and movies like Moonlight, especially in light of our recent election and that the incoming Vice President isn’t a fan of basic human rights for the LGBT community. November 21, 2016 in 2016 Film Reviews, Movie Reviews.